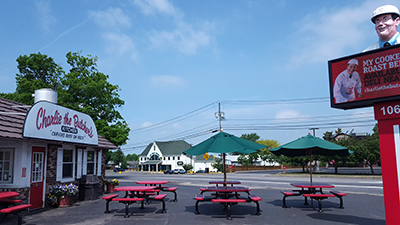 Thought about returning to Anchor Bar on the way through Buffalo to Cooperstown but saw online someone got shot there the day before and if it was open…well…we’ll wait a little bit. 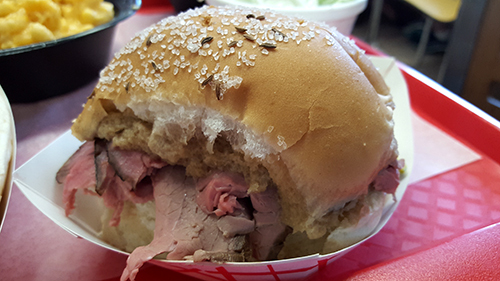 An online search brought us to Charlie the Butcher, famous for another Buffalo staple, beef on weck. It’s not only real but a serious thing. 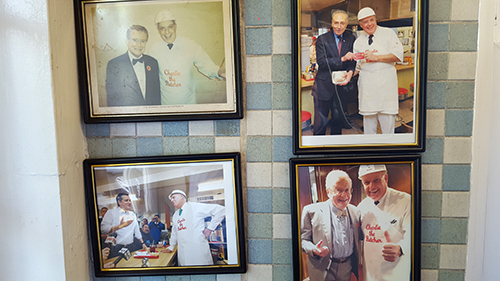 Charlie himself was behind the counter measuring out the seasoning for his roast beef like he was splitting atoms. It must work. The little storefront was soon filled with customers eyeing the roast beef being sliced in front of them like a cheetah watching fat and dumb antelope with only one eye and a limp. 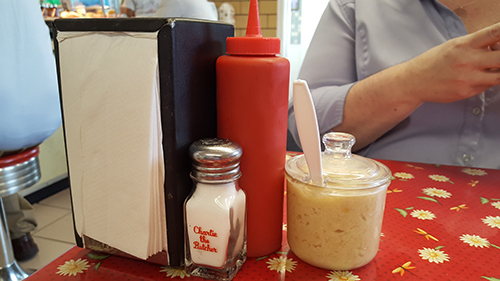 We settled into one of the few tables, most of the lunches walked out the door, and wondered at the peculiar trays of condiments. 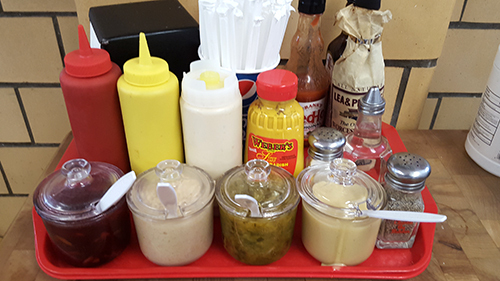 Soon, our name was called and a loaded tray of awesome arrived. 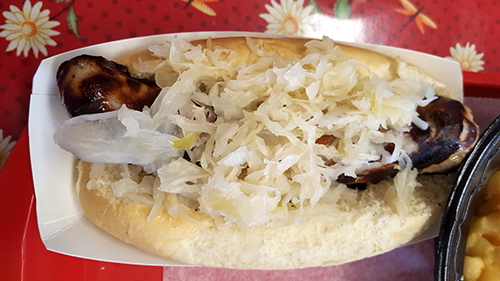 The bratwurst and the kraut were rich with a bit of tangy, but I was surprised how mild both turned out to be. 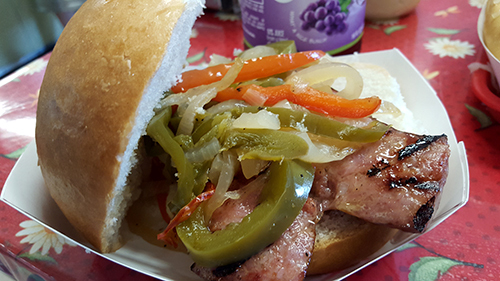 The garlic in the Polish stood out through the bun and peppers/onions and worked wonderfully with the variety of mustards. 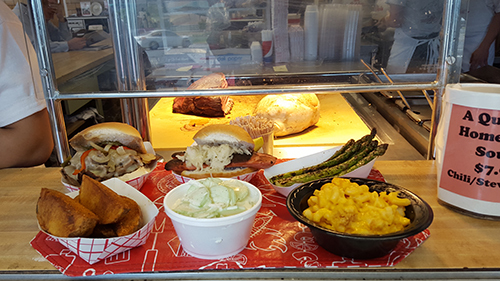 When it comes to the beef and the kimmelweck roll, the beef is actually really tasty. I wish they would slice it thinner as it has serious tug and chew for a sandwich filling. A smear of the Broadway Market horseradish and it went from delicious to excellent, just had trouble forcing my teeth through it. The roll, topped with large granules of salt and some caraway seeds was made for the beef. 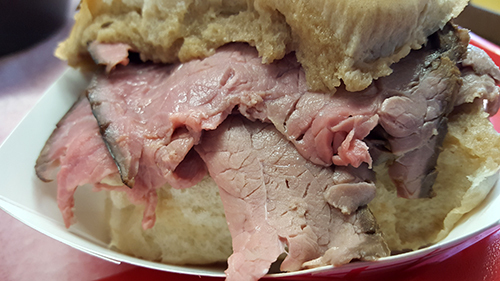 You can order the beef on a plain roll but if you do, they will deduct 7½ points from your I.Q. score. The sides were worth ordering. 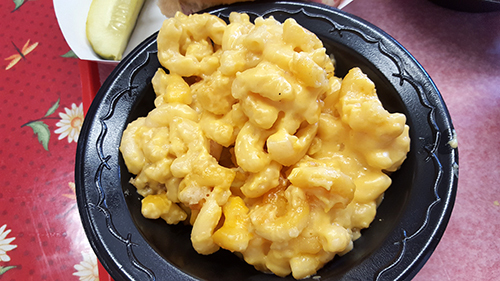 The mac & cheese was soft but loaded with cheese and cheesy flavor. That should happen more often than it does. 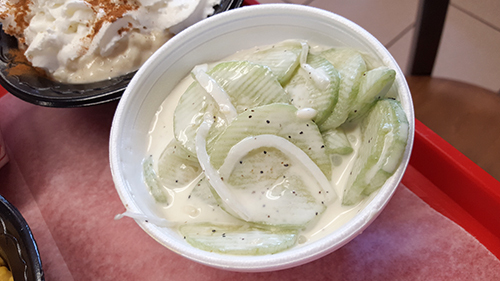 The creamed cucumber with flavorful sauce, sliced onion and some kind of seed (celery?) was refreshingly super tasty. Even Steph like them, onions and all. 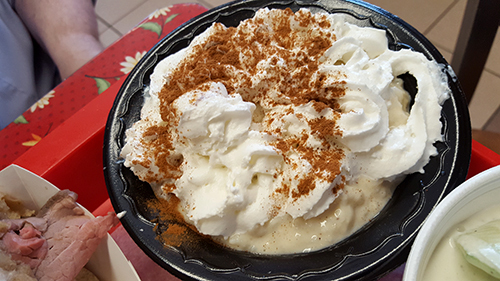 We ended with a huge bowl of rice pudding. I still don’t get it. Mmmmmmm. Pudding. Delicious. I know. Let’s put something lumpy into it. Something desserty? No, rice. The only one I ever really enjoyed was from Berry’s in Norwalk…it was barely sweet. Charlie’s was definitely sweet, fine, just not my thing. Chalk up two signature Buffalo dishes. On the way back through Buffalo we ran out of local classics and ran in the other direction.